Texas Toast - forget buying frozen Cheesy Garlic Texas Toast at the store - now you can make it fresh right at home! Homemade garlic toast tastes so much better! Whenever we have Baked Spaghetti or any pasta dish for dinner, we make sure to have some sort of garlic bread with it. My family loves the Garlic Texas Toast you can buy in the freezer section of the grocery store, so I decided to whip up some at home! This recipe is so easy and takes minutes to make. It only has a few ingredients, and it tastes 10 times better than any frozen garlic bread you will buy at the store. Start with your bread. You can make homemade bread (you need to try our Easy Homemade French Bread), or store-bought bread. I usually like mine a little thicker, so I look for the Texas toast sliced bread, on the bread aisle. You can also use any bread you have on hand, it doesn’t need to be Texas toast or french bread, but we do recommend it. There is something about biting into fresh thick bread with cheese and garlic spread… it doesn’t get any better than that. Now prepare your spread. You can’t go wrong with four ingredients that you most likely already have on hand. Mix together butter and garlic powder in a small bowl. Add salt and pepper if desired. Once on the baking sheet, put them in the oven and broil them. As they broil, watch carefully. Broiling food can be tricky so never let something go for more than a minute without checking on it. Once the toasts are done, take them out of the oven, sprinkle some cheese and a little Italian seasoning, and throw them back in the broiler for just a minute. For this particular recipe, we prefer mozzarella cheese, but any cheese will do. I bet a cheese combination with a little Parmesan cheese would be delicious as well. To save yourself even more time, you can buy the shredded cheese at the store so you don’t have to shred or slice it yourself. This pairs perfectly with our Ground Turkey Spaghetti and our Parmesan Ranch Corn. You could also eat this as an appetizer with some marinara sauce. It’s almost like a breadstick or a little pizza. The kids will love this as well. This is a fun recipe that kids could easily help with. I’ve found that for picky eaters, they are more likely to eat it if they participated in making it. Preheat broiler setting on oven. Mix together butter and garlic powder in a small bowl. Add salt and pepper, to taste. Brush both sides of each slice of bread with butter mixture and place on an ungreased baking sheet. Broil bread for 1 minute on each side, or until light golden brown. Sprinkle one side of bread with cheese and Italian seasoning and broil until cheese is melted. Watch closely to avoid burning. Did you know we have a YouTube Channel? You can find delicious recipe tutorials like this one, that go perfect with you Cheesy Garlic Texas Toast. Click here to see more. Our newest cookbook is currently on sale now! It’s full of restaurant copycat recipes that you are going to love. It includes copycat recipes from all your favorite restaurants including Cheesecake Factory, Panera, Chick Fil A, Olive Garden, Texas Roadhouse and so many more. 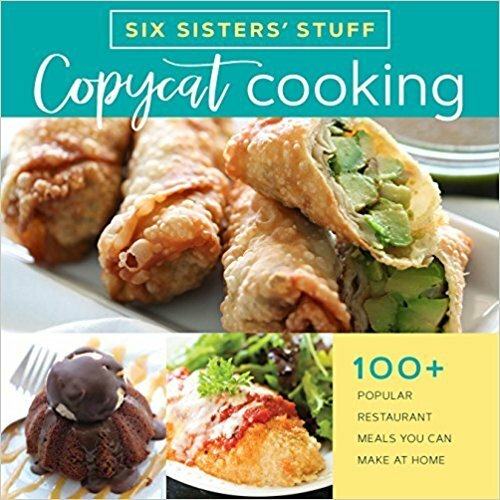 Get your copy of Copycat Cooking with Six Sisters’ Stuff here! Yum, I am making these tonight - So far all your recipes have been winners with my 5 kids, so thanks for sharing! There are not many suppers that this wouldn't be good with, yum! I adore homemade garlic bread! So easy and so much yummier than frozen!